After opening the season by smashing Louisiana State University’s (LSU) indoor school record in the shot put at the LSU Invitational on 9 January, Lady Tiger senior Tori Bliss eclipsed her own mark and extended her NCAA lead in the event with a winning throw of 57ft-4¾in at the Rod McCravy Memorial Meet on Saturday (25th). Just one season after scoring the NCAA Outdoor silver medal as the national runner-up in the shot put to cap her junior season, Bliss has become a leading contender for the NCAA Indoor crown as she has now won three straight titles to open her senior season while posting the four best shot put marks by a collegiate athlete in 2015. Saturday’s victory makes Bliss the dominant thrower since the start of 2015; she is now a perfect 3-for-3 in the shot put. She took a commanding lead with an opening throw of 55’-10½” in the first round and never threw shorter, taking the title over Missouri’s duo of Jill Rushin (54-1’¼”) in second place and Kearsten Peoples (53’-11 ¾”) in third place in the final. 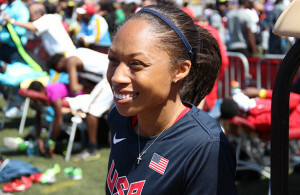 Bliss extended her lead with a throw of 55’-11” in the fifth round; she then sealed victory with a new lifetime best of 57’-4¾” in the sixth round to raise her national-leading mark in the event. A native of Portage, Indiana, Bliss eclipsed her own indoor school record by two inches after opening the season with a throw of 57’-2 ¾” at the LSU Indoor Invitational. 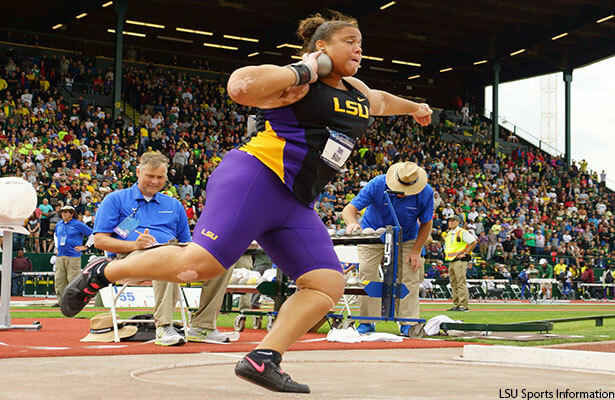 She now boasts four marks better than any other shot putter in the NCAA with throws of 56’-8¾” and 57’-2 ¾” at the LSU Indoor Invitational, 56’-4½” at the Auburn Indoor Invitational and 57’-4 ¾” on Saturday.